China is developing a next-generation bullet train that can run at 400 kilometers an hour and is suitable for cross-border services, a senior researcher with the nation's high-speed rail program said on Sunday. "The train, to be developed in the 13th Five-Year Plan period (2016-20), will have wheels that can be adjusted to fit various gauges on other countries' tracks, compared with trains now that need to have their wheels changed before entering foreign systems," said Jia Limin, a professor at Beijing Jiaotong University and head of China's high-speed rail innovation program. "Once the new bullet train is put into service, it will operate on China's rail network as well as on the Moscow-Kazan high-speed line in Russia, which is designed for 400 km/h trains," he added, referring to the 770-km link that connects Moscow and Kazan, a metropolis on the Volga River. The rail line is a joint venture between China and Russia. According to an agreement by Chinese and Russian authorities, the Moscow-Kazan line is likely to be extended to Beijing, which will significantly reduce rail travel times between the two nation's capitals. Wheels on trains now traveling between China and Russia have be changed before crossing the border because the gauges are different. The new bullet train will not require this procedure, saving time and money, Jia said. He was speaking in Beijing on the sidelines of the 12th Five-Year Plan (2011-15) Technology and Innovation Achievements Exhibition. Currently, high-speed trains in China run at speeds ranging from 250 to 300 km/h, although their maximum speed can reach about 350 km/h. With the aim of exploring new concepts, Jia said China has developed and begun to test an ultrafast bullet train that is potentially able to travel at 600 km/h. The train has been made by CRRC Qingdao Sifang Co, a subsidiary of the country's largest train maker, China Railway Rolling Stock Corp, in Shandong province. The ultrafast train is being used to trial cutting-edge technologies, advanced materials and to test operational limits, the professor said, adding that its development means China is now able to design and manufacture trains that can travel at least 500 km/h. 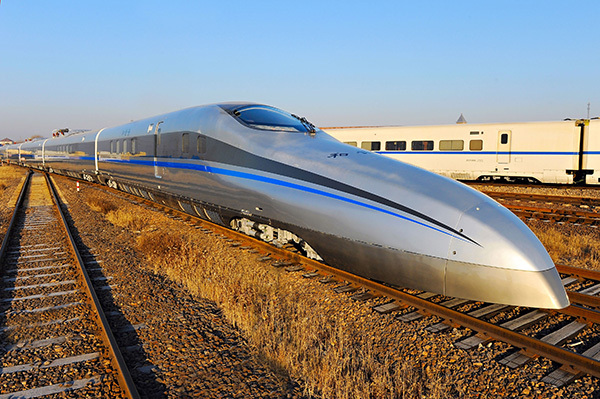 However, Liu Youmei, a bullet train expert and academic at the Chinese Academy of Engineering, said that under the current conditions, the maximum speed for high-speed railways cannot exceed 400 km/h because higher speeds will incur much higher operation costs. He said the ultrafast train should be used only for demonstrating new concepts and technologies rather than commercial operation.